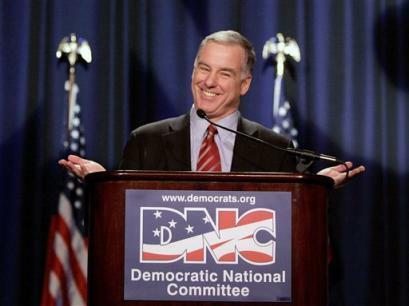 New national Democratic Chairman Howard Dean promised Saturday to rebuild the party in the most conservative regions of the USA, help develop state organizations and let congressional Democrats set the tone on policy. Electing Dean on a voice vote during their winter meeting, Democrats put the party's leadership in the hands of the skilled fund-raiser and organizer whose sometimes caustic, blunt comments can lead to controversy. The physician now must contend with a state-by-state political map in which Republican red overwhelms Democratic blue. "I'll pretty much be living in red states in the South and West for quite a while," Dean told reporters. "The way to get people not to be skeptical about you is to show up and say what you think." The normally outspoken Dean appeared to be trying to shift his role from flamboyant presidential candidate to cautious party chairman. "The proper place for the day-to-day battles is Congress," Dean said in response to a question about his opposition to the war in Iraq. "My views are well known, but most of the policy pronouncements will be coming from the leaders in Congress and not from me." Dean has plenty of other chores to keep him busy. President Bush just won his second term. Republicans are firmly in control of the House and the Senate. And the GOP is gaining strength in conservative states in the South and West. The former Vermont governor promised to learn how Democrats can communicate positions more effectively. Dean says that no one is "pro-abortion," but "we are the party in favor of allowing women to make up their own minds about their health care." And Democrats are not for "gay marriage," but "we are the party that has always believed in equal rights under the law for all people," he says. Dean is determined to seize the moral high ground from Republicans, arguing Democratic positions on helping the poor and protecting children are consistent with religious values. The new chairman sounded like a man in a hurry: "Republicans wandered in the wilderness for 40 years before regaining Congress. ... The American people cannot afford to wait 40 years for us to regain control in Washington and put the government back to work for Americans." Dean has been criticizing Republicans all week and has promised to stay on the offensive, but GOP Chairman Ken Mehlman contacted Dean to congratulate him and then put out a statement describing Dean as "a strong leader for his party." The kid-glove treatment is unlikely to last. Reminded Saturday that former Republican House Speaker Newt Gingrich had said Dean would be the perfect leader for Democrats if they have a "death wish," Dean smiled broadly and said: "I'm looking forward to the opportunity to prove Newt wrong." On Saturday, Sen. John Kerry of Massachusetts gave the DNC another $225,000, donated by Kerry supporters, for grass-roots development. The 2004 presidential nominee gave $1 million last week. As Dean takes on his new DNC duties, his brother Jim takes over the former governor's political action committee ― Democracy for America. Howard Dean replaces outgoing party chief Terry McAuliffe, who raised more money than Republicans in the last election cycle, developed a sophisticated voter file and e-mail list, and left the party in the black after the presidential election. Democrats generally sounded an optimistic tone about Dean, hoping for the best from their new chairman who is attempting to show more restraint. When Dean was asked about anonymous criticism from both Democrats and Republicans, he quickly brushed it aside, saying, "I'm not going to respond to blind quotes."